The most beautiful sight in baseball, according to ejforbes Contributing Writer Leif Skodnick, is of Wrigley Field, seen here during a recent Cubs-Brewers game. I recently spent the better part of a week in Chicago, and finally got to visit Wrigley Field, a place from which I have watched countless games on television. Just a few blocks after the ‘L’ lurches around a curve just past the Sheridan stop on the Red Line headed south, I caught my first in-person glimpse of Wrigley Field, its light standards reaching for the sky over the rooftops of Lakeview with the grandstand roof asserting its extra story of authority. Stubby stone and brick buildings crowding the park, and the smells of pizza, beer, meats being grilled and railroad brakes join the cacophony of city sounds that you don’t often hear around a major league ball park in the modern era. With other plans on Monday evening (meaning I wouldn’t be seeing four major league games in four nights), I went to the corner of Addison and Clark and bought a $25 ticket for the noon tour of Wrigley Field. It was probably 25 or so years ago that I first saw what Steve Goodman so aptly described as an “Ivy-covered burial ground,” where for 94 years, Cubs fans have hoped for a World Series Championship and seen those hopes “crushed, like so many paper beer cups, year after year after year… after year after year after year,” on an afternoon broadcast of a Mets game on WWOR-TV on Sears television set with rabbit ears. When you see Wrigley Field empty of fans, it evokes a similar feeling to standing at the high water mark of the Confederacy in Gettysburg. In Gettysburg, you look upon down from the top of the hill and see the battlefield where, for the South, the cause was lost. At Wrigley Field, when you begin the tour, you look down from the top of the bleachers at the battlefield where, for the Cubs, the cause was lost… year after year, after year after year after year. The silent history consumes you sitting in the empty ballpark. This is where Babe Ruth called his shot in the 1932 World Series, pointing to the outfield and blasting a home run off the Cubs’ Charlie Root. It’s where Mr. Cub, Ernie Banks, patrolled the infield and hit his 500th home run, where Mordecai “Three Finger” Brown and Greg Maddux pitched, where Ryne Sandberg turned double plays. Unfortunately for Cubs fans, the history is equally or perhaps more torturous at times than it is beautiful. This is where, in Game Six of the 2003 National League Championship Series, with the Cubs leading the Florida Marlins 3-0 and just five outs away from the World Series, (which they last visited, as Goodman tells us, “the year we dropped the bomb on Japan,”) a suburban youth baseball coach knocked an-almost-certainly-to-be-caught foul pop from the glove of Cubs left fielder Moises Alou. The Marlins rallied, won the game and the series, and Cubs fans still revile Steve Bartman to this day. Several years earlier, in 1998, the Cubs made the playoffs for the first time in nine years, winning a dramatic play-in game over San Francisco, then responded in true Cubby fashion by scoring just four runs in three games while being swept by Atlanta. 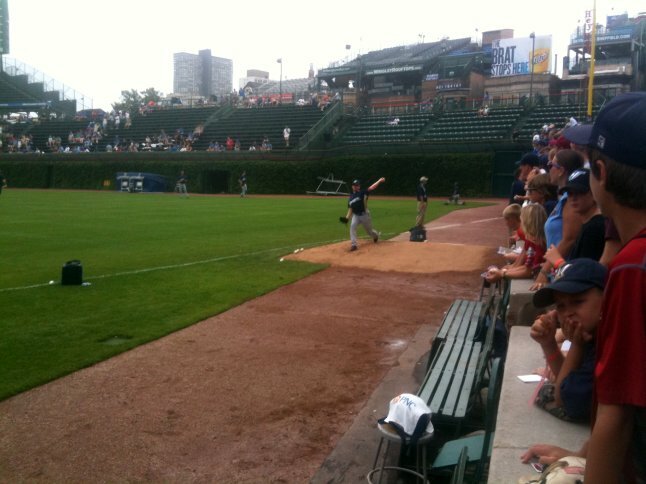 On this very same field, the Cubs have hosted four World Series, the most recent in 1945. 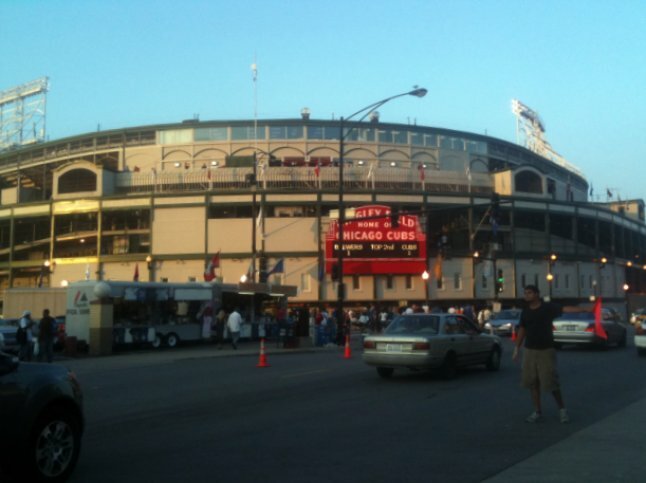 In their two most recent appearances in the Fall Classic, not only did the Cubs lose the Series, the deciding game was played at Wrigley Field. 1932, Cubs fans had to watch as the Babe Ruth and the Yankees swept the Cubs, taking Game Four at Wrigley by the score of 13-6, and in 1945, the Cubs lost Game Seven to Detroit 9-3. But that history is embraced by the fans of the Northsiders, with t-shirts proclaiming, “We might not win the pennant, but we never lose a party!” for sale on the streets outside. 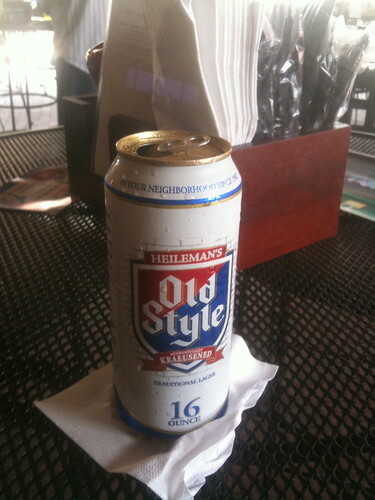 Old Style beer at Wrigley. Copious amounts of Old Style beer, originally brewed by G. Heilemann & Co. and now produced by Pabst, keep Cubs’ fans throats moist during the heat of the summer and their bodies warm during the chill of spring and fall. When you visit Wrigley, there’s an eternal optimism that envelopes the place, as the “Friendly Confines” nickname bestowed upon it attests. I suppose, if you review the history, it would be unexpected, seeing as how one championship was won by a team that played here, and it wasn’t by the Cubs (It was by the Chicago Whales of the Federal League in 1915). After we sat through a close 4-3 loss to the Brewers on Tuesday night, I returned Wednesday. 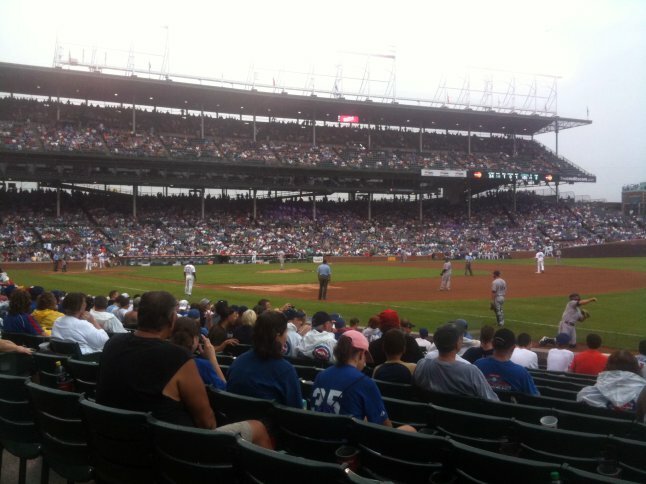 Why make a trip to Wrigley Field if you aren’t going to see a day game? It was overcast and dreary, not unlike the outlook for the Cubs to make the World Series anytime soon. Light rain fell through most of the game. The Cubbies won 15-3. League Championship Series began, and like the fan in his immortal song, his ashes were scattered in the infield. His good friend Jimmy Buffett took his place in singing the Star Spangled Banner at the first Cubs home playoff game in 39 years. 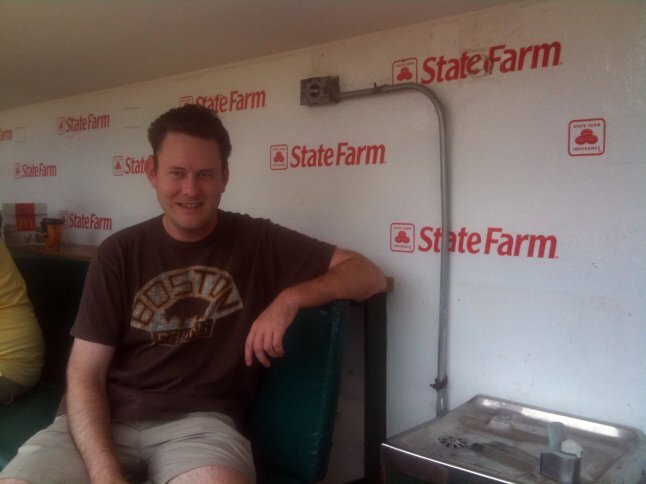 Leif takes a seat in the Cubs’ dugout at Wrigley. The Brewers’ Randy Wolf nears the release point. 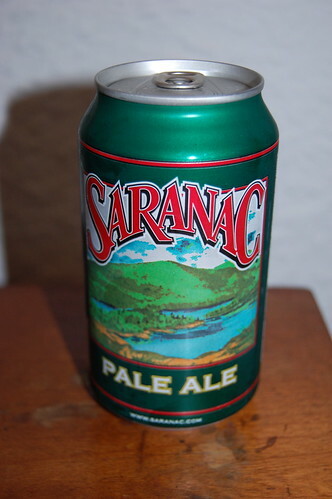 Saranac Pale Ale, a North Country staple, is now being marketed in cans. Across the northern sections of our state, anyone who’s ever packed beers into a cooler is rejoycing: Saranac Pale Ale is now being sold in cans. 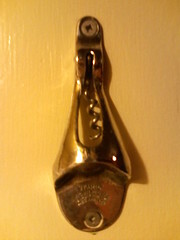 I discovered this fact a few weeks ago during a stay at Canaras, where the pride of F.X. Matt Brewery was being served in aluminum. Saranac Pale Ale, served in bars from Boonville to Bolton Landing, is the flagship beer of the Saranac line. Long served in brown glass, its sale in cans was welcome news. On our way south to home, we picked up a 12-pack. I’ve been gently depleting its hoppy supply ever since. I don’t find the taste to be altered at all. If anything, the canned version is hoppier, a plus in my book. These go down smooth and cold and complement grilled meals quite well. Of course, F.X. Matt is familiar with canning. Its venerable Utica Club has been primarily marketed in cans so long as I’ve been drinking it. I’ve not found these cans south of Albany nor have I looked terribly hard. Let me know if you’ve seen them anywhere in the metropolitan area. Does anyone know if Matt plans to market any of its other Saranac varietals in cans? Having been iced, Tim meets the challenge with characteristic enthusiasm. The suburban crowd got together the other night to celebrate two birthdays: our good friend Tim’s 30th and our good friend Amy’s 25th. We gathered at American Yacht Club in Rye, of which Tim is a member, and had a very nice little picnic. After we’d finished our cheeseburgers, hot dogs and potato salad, it seemed time to present the birthday boy and girl with their cupcakes. But first they had to be iced. 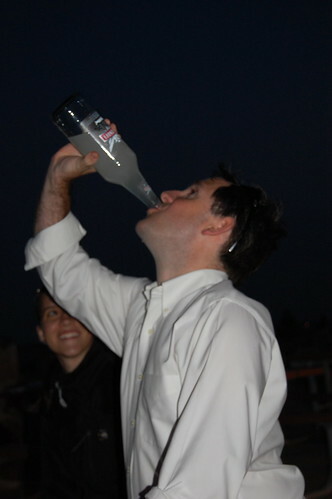 Our friend Will produced a 40-ounce bottle of Smirnoff ice, which Amy and Tim proceeded to share. 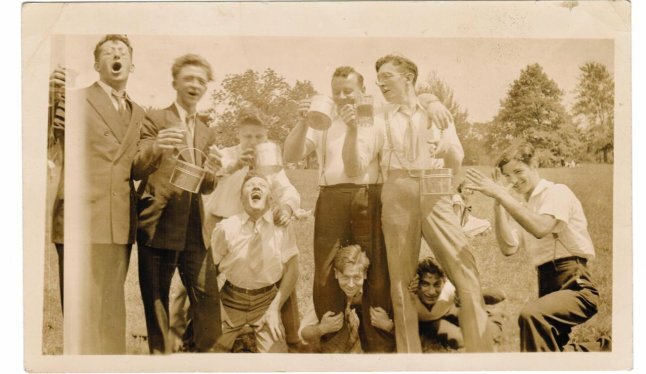 Tim had a bit of a reputation in college for being able to chug beers and Lindsey claims he has no gag reflex. Fascinating. At any rate, the icing phenomenon has been discussed widely this spring. Brosicingbros.com, chief organ of the trend, has closed, but the Times carried a business story a couple of weeks ago that speculated on whether or not icing was a publicity stunt spearheaded by Smirnoff. The story caused a bit of a stir in the Laurentian diaspora as the reported noted that many trace icing to St. Lawrence University, a fact that a lot of anecdotal evidence I’ve gathered supports. Members of the Class of 2007 confirm that icing has been a part of their playbooks since at least 2005. The Times piece also wonders if the game began in Burlington, Vt., a city that’s home to legions of Larries. But other colleges across the land are both claiming to be the birthplaces of icing and embracing the trend. At Hobart College’s Commencement earlier this spring, a senior attempted to ice Mark Gearan, former head of the Peace Corps and president of Hobart and William Smith Colleges for nearly a decade. Gearan demurred. Icing is happening around New York city as well. Tim’s younger brother, home for a summer internship in the financial world, reported being iced by a stranger in the middle of Grand Central Terminal a few weeks ago. It’ll be interesting to see if the game endures or whether, as so many collegiate trends have done, it dies on the vines of summer. Dale’s Pale Ale, a new favorite. Beer and I used to be quite close. Too close, probably. But that was college and since, as I’ve mostly relied on Scotch and, in the last two years, a range of cocktails to satiate. Some months ago though, while enduring the White Plains Whole Foods on a Saturday morning (a dark, dark time to travel to the county seat for any errand), I happened upon the beer aisle. 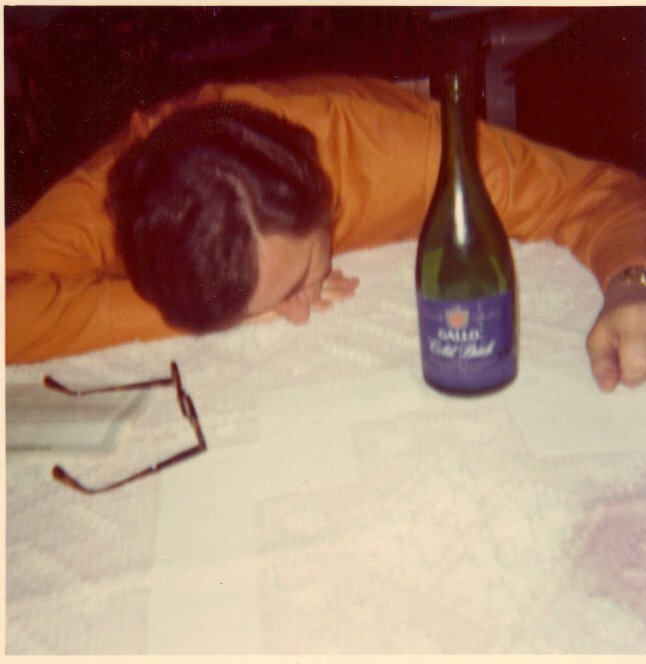 The predictable stuff was there: Samuel Smith, Dogfish Head, PBR. There was another canned beer that intrigued: Dale’s Pale Ale. Pale ales have always been favorites and I was fascinated by the idea of a canned offering. Interrupted by Mrs F., who wanted to head to the cheese case, I left my curiosity in the beer aisle. In Arizona, hopping around Tucson with Maxie, I rediscovered it. We bought a couple of cans at Plaza Liquors and consumed them for lunch back at his spread. The glorious hoppiness delighted us both, as did the fact that we were drinking a pale ale from a can. 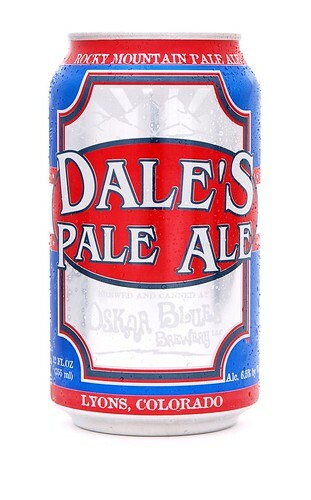 Brewed by Oskar Blues Brewery in Lyons, Colo. since 2002, Dale’s claims to be the nation’s first canned pale ale. I’m not the first to sing its praises. Dale’s has received plaudits from the Times, who have crowned it the best American pale ale and also at the World Beer Championships, where the beer won a gold medal this year. It’s a perfect and speedy remedy on unexpectedly hot days like today. I strongly endorse it. 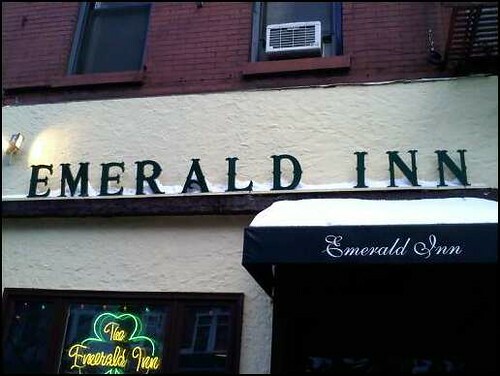 The Emerald Inn, a piece of Old New York between 69th and 70th streets on Columbus Avenue. Walking out of the slushy mess that was the Upper West Side of Manhattan on Monday and into the snug comfort of the Emerald Inn, an Irish bar that’s been a neighborhood staple for decades, was like happening on an oasis in a desert. The Emerald, as its denizens know it, was started in 1943 or 1944 and has been a fixture ever since. Earlier this year, though, it looked like the Emerald might go the way of the Dodo. When the building’s owners informed the Campbell family that their rent would double, plans were made to shutter the bar at the end of April. The poor economy, however, proved the Emerald’s savior, as no new tenant could be found for the space. For two more years at least, the Times reported earlier this year, the Emerald will carry on. Readers who enjoy the discovery of time capsules left by an earlier New York will delight in the Emerald, whose walnut paneling probably dates to the Don Draper era or earlier. A group of about eight booths surround a long, narrow main bar, behind which is cabinetry that was probably installed around 1970. Truly, the only modern things about the Emerald are its flat-paneled televisions. You might also like the people watching. Beyond the neighborhood gang who are happy to have found an unassuming oasis, the ABC crowd is also particularly fond of the place. Try the burger or the fish and chips and obviously, take a Guinness. The food is modestly priced, but the pints are about $5. No matter — the atmosphere more than makes up for it. 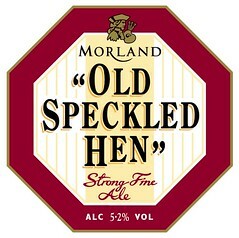 Morland’s “Old Speckled Hen” has been a favorite for 10 years or more. 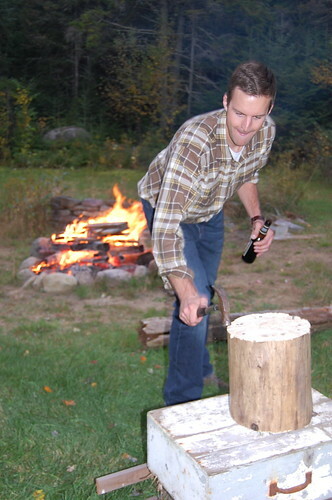 The airing of the latest Ken Burns project, “The National Parks: America’s Best Idea,” reminds me of where I was 10 years ago. Somewhere around the end of September or the beginning of October 1999, Ken Burns’ brother, Ric Burns, debuted his “New York” documentary on PBS. Leifer, Johnny Ward and I watched every night in their room, Sykes Hall 3621. As we solidified our knowledge of city’s history, we smoked too many Marlboro Lights and drank more than our share of “Old Speckled Hen,” the Oxfordshire ale. Johnny’d brought a few cases of the stuff back from the Beverage Mart on Route 22 in Eastchester. We marched right through it and have all had a soft spot for it since. 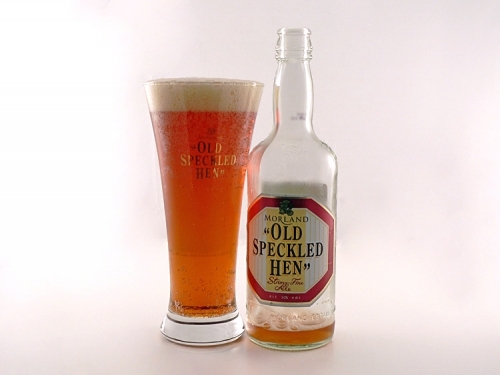 The Hen was created in 1979 to celebrate the 50th anniversary of the MG plant in Abingdon, Oxfordshire where Morland’s Brewery was also located. 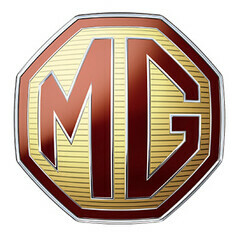 The bitter is named for the “Old Speckled ‘Un,” a ‘29 demonstration model MG that sported a gold-flecked black body. You’ll notice the Hen’s logo takes its octagonal shape and coloring from MG’s. 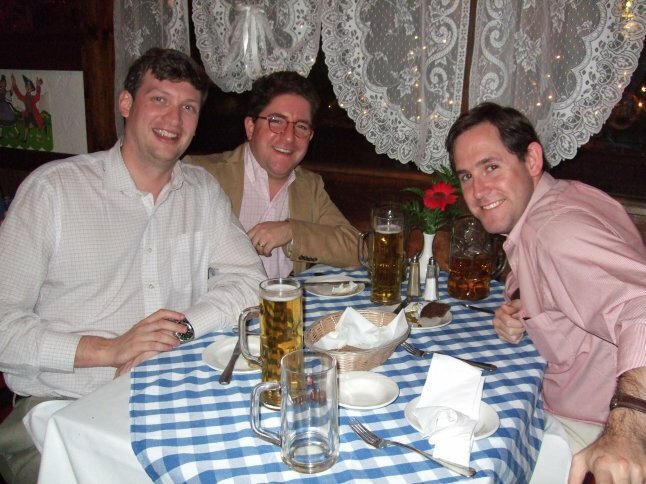 Jackson, the Beer Hunter, died in 2007, but his encyclopedic Web site endures. Much more on Morland’s and the Hen here.